I was a little weary about driving down to Busch Gardens, but after talking to one of the holiday Reps, I decided that I would drive. 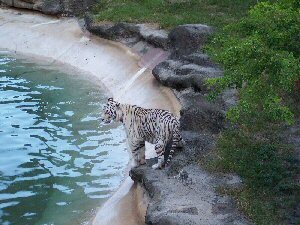 I set off around 9:00am and after a nice drive down I4, I arrived at Busch Gardens just after 10:00am. I entered the park, got a map and planned a route out. I first headed to Gwazi, a wooden coaster. Only one side was running, but it was still a great coaster. Wooden coasters still have that something you don't get from a steel coaster. After Gwazi, I headed up through Bird Gardens and up to StanleyVille. When I got there, both Tidal Wave and Stanley Falls Fume were not running, So I decided to continue onto Congo. 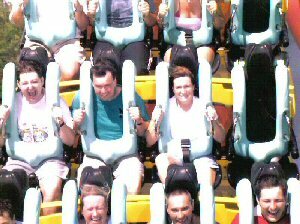 I first rode Python, a short two inversion coaster. Nice and fun. Then onto Congo River Rapids. I like these, and I think that everyone in the raft got wet, a few wetter than others. Next, Kumba, a 7 inversion coaster. I really liked this, it was not too intense, but still gave some great adrenaline rushes, and a great ride. You can see my on-ride photo on this page. The Stanley Falls Fume was now running so I decided to go on it. I found it tame, compared to other log flumes. I didn't get wet, though it may have been because I was on my own though. 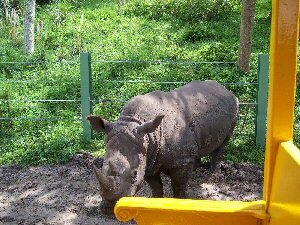 So I now made my way through Timbuktu and onto Rhino Rally. A very nice tour and ride combined in one, lovely to see many different animals in their own habitats. After I departed this I made my way to Nairobi and the Nairobi Train Station. The train takes you around the Serengeti Plain, where you get to see more animals in their natural habitats, roaming free. Everything from Alligators to Zebras, they are all here. This was great for a lot of photo opportunities. Time for something to eat, before I move onto Egypt and Montu. 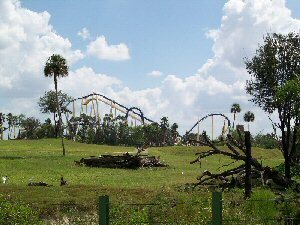 Montu is one of the tallest inverted coasters around and has one of the tallest vertical loops on an inverted coaster too. Montu is a truly exhilarating roller coaster. It was so great that I rode it twice in succession, due to there being no queue too. I hardly ever do that. It was great! First time round I went in the front seats, and the second time, in the second row. I now made my way back round to Tidal Wave which was now running. Tidal Wave starts with a gentle ride through a jungle themed area. The boat gently moving along. Then you start to climb up an incline, and shortly after you reach the top, you plunge 55ft down. You hit the water and a wall of water rises in front of you and everyone gets soaked. I got off, soaked through, and went straight back on for a second round. After I got off the second time, I thought it would be fun to stand on the bridge that is in front of the drop. Down came the boat, hit the water and sent up a wall of water that comes straight at you. When the water hits you, you end up soaked from head to toe. There is no escape. I could ring the water out of my socks afterwards. It was great! I was dripping wet, so I decided to walk around for a while, to try to dry off a bit. It didn't do much good. So by 5:00pm I decided that it was time to start heading back. I had spent around 7 hours at Busch Gardens, and I still had an hours drive back to my hotel. This was yet another great day out, second only to my day at Discovery Cove. I had ridden 3 inverting coasters, and had been turned upside down 23 times. Fantastic! This is one trip that I will remember.